The Presents For Strangers Project | PROOF OF GOD! ...and other tragedies. 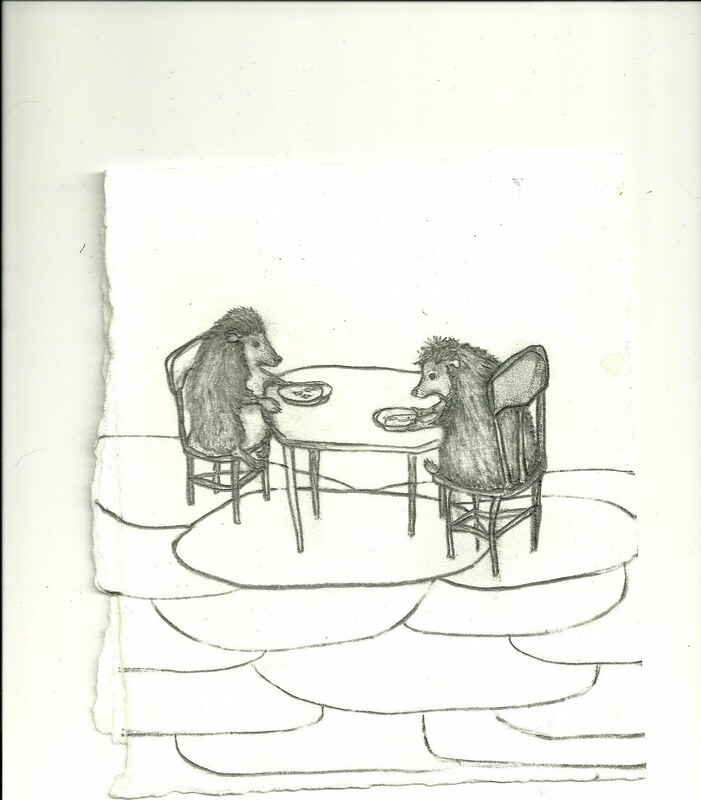 I drew this picture of two hedgehog ladies having a snack. Places near bridges are often overlooked. This is my favorite sentence today. It’s raining slush. Not sleet, not snow, not rain. Slush. Whoa…it just changed to sleet. Bits of it, however, seem to be falling slowly, from higher clouds. Even a hideous damp and chilly morning like this can be interesting. As long as you’re interested. See what happens if you don’t watch a lot of television. Trying to get my head out of the ethers this morning. Everything is dripping outside. Warmer than expected. Things that need to happen this morning: cut up the gown, fold the laundry, make eight more birds for my first launch of 20. Because small things change days. I won’t claim to be changing lives with these projects. However, I know a moment or two will be impacted in a positive and wondrous way. Like this one, right now. Small and easy to hide! The perfect anonymous present! Desk drawers, lockers, car antennas! These little birds can fly anywhere! …and imagine the confused delight on your lonely coworker’s face when they find that what appears to be a twisted length of wire is actually a small bird in flight. with someone who you hardly even know! These birds are free. However please feel free to make a donation – for the next 3 months: all proceeds go to support experiential field trip funds/scholarships for elementary students of Asheville City Schools. All children need easy access to possibility. The funds will be divided between the PTO’s of each ACS Magnet Elementary: Isaac Dickson, Hall Fletcher, Claxton, Ira B. Jones, and Vance. This is a project of The League of Left Fields. So far, this league includes only me, myself, and I. It is, however, the real deal. Big things start small. Quiet collaborators from all artistic backgrounds are being sought. Hmmm…maybe I’d better make 50. They are easy to make…a length of fine gauge (20 or 22) wire wrapped loosely around the finger, until it has eight or nine loops. Twist at least one of the pokey ends around the pull it tight, grasping the loops between thumb and index finger so as not to disturb their, um…loopiness? The loops should now be held together in a way that is sort of like a ring. Twist and form loops into wings (2-4 loops are usually needed for good wings.) The remaining loops can now be fashioned into heads and tails. And there you have a bird. The wire can only be twisted a couple of times before the material integrity is compromised (friction and molecular movement!) That’s what makes these birds special, they are what they are and once they are done, they are hard to re-do. Feel free to grow this project in your own community. Give credit where credit is due and provide the original text in bold above. If you live outside of the Asheville City Schools District, please substitute your local district and WORK TOGETHER! Local inquiries can be directed to The League of Left Fields c/o (for now…) www.the365daysoffaith.blogspot.com. Updated contact information will be provided as needed. If you are a non-profit serving low -income children in WNC and are interested in being the recipient of donations to The Presents for Strangers project, please feel free to contact me. Donations to this project are not directly Tax Deductible. However, I’m working on that. If you would like a receipt for your donation, just leave me a note with your donation and I’ll be happy to document your support of the Presents for Strangers project. Or better yet, just leave a couple of dollars and take a bird. Small contributions add up. Any wire will do, by the way. I like copper because it’s soft and easy on the fingers. Aluminum and steel work well too, but steel gives a sharper twist. Which may be good depending on how pokey you want to make your birds. 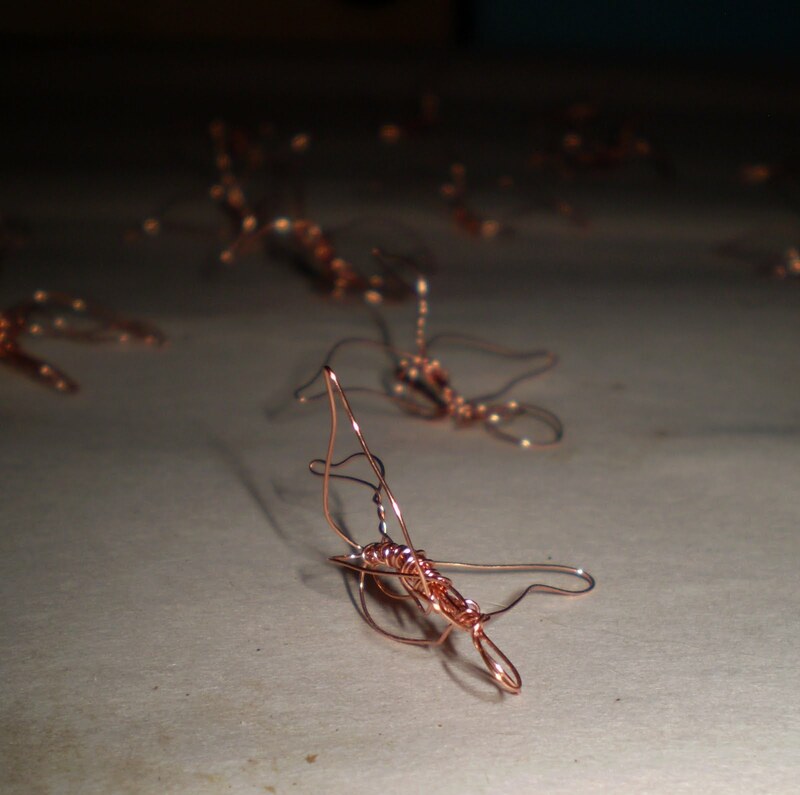 Don’t try to use industrial wire (mig wire, etc.)! Especially if you work on this project with kids. (The big cheap rolls at the do-it-yourself big box) A lot of this stuff is made from alloys that are specific to their function (conductivity, etc.) and may contain lead, as well as chemical oils designed to delay corrosion. Check a LOCAL arts and craft supply store. In Asheville, the Chevron Trading Post has a beautiful array of wire. Even gold, I think. 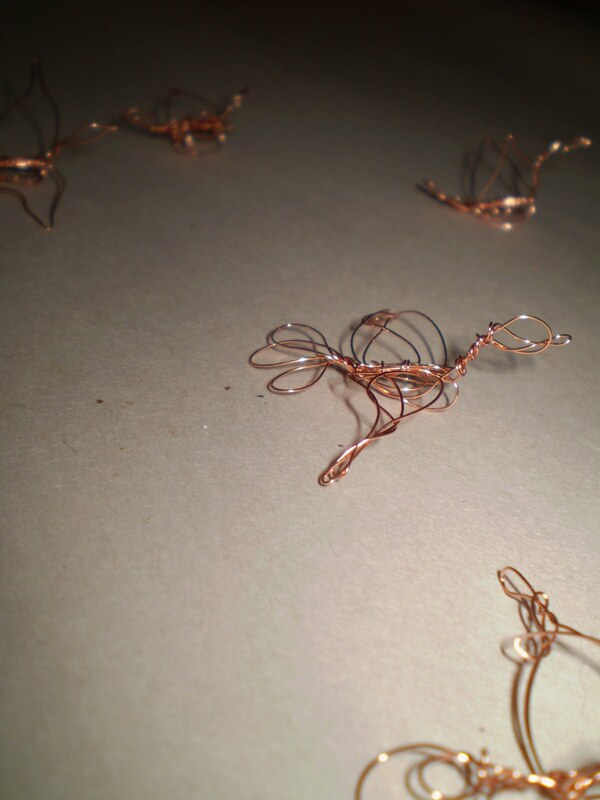 If anyone would like to buy me some gold wire, I’d be happy to make some big-money birds. $10.00? Do the math? 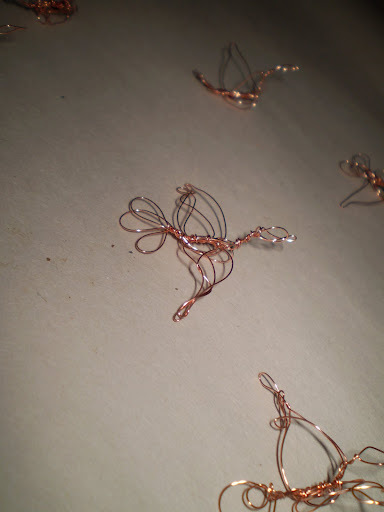 I am making these tiny-ish birds out of copper wire. They are about an 1 -1.5 inches long. I will tie them to small cards, with text informing people to take one. Of course, the the URL to this weblog will be printed on the back. If people want to make a donation in exchange for their small present, that’s fine. Otherwise, they are free. A way to say hello, without saying a word. Coming out of nowhere is what I do best. If the name’s not taken, I will now be the formal representative of The League of Left Fields. We are out there. Let’s work together. Micro Kicks the Macro Out! The value of weather is that it acts as some fundamental glue between humans. Reminds us of our larger shared setting. Reminds us how small we really are…how silly we look when we are wet and cold. This morning, people all over town are waking up and looking out the window and sighing defeatedly: the rain looks a little like ice falling from the sky, which it is about 1 or 2 degrees from being. Snow last night. Slush today. They call it a Wintry Mix. Sort of a jaunty phrase for the worst sort of Asheville Winter Weather. The mountains aren’t so cozy now are they? I am glad I don’t live in a kerosene heated trailer on the north side of a mountain. I pay close attention to the children that come to the museum from surrounding counties. Tiny kids, kindergarteners mostly. They come over mountains for field trips. And I know in my bones that some of these kids are cold at night. That some of the have grown-ups that are tired and cranky and worried and scared. There is often a child or two that seems a bit gray. However, the vast majority of these busloads of children are combed and scrubbed and tidy. Their clothes are well-washed and fastened correctly. They look respectable. Sometimes, the small girls wear fancy dresses and brand-new shoes. Their feet must ache, but they don’t seem to notice because they are SO EXCITED! These field trips, for some, will be the only time they leave their home counties this year. And it stuns me to imagine that these well-cared for children, with their clean faces and good manners, might come from homes that are struggling to keep warm this winter. Their grown-ups likely aren’t people who have time, they are probably strained in a million ways. Nonetheless, their kids are clean and well-behaved. It is not, as someone who tries very hard to promote tidy well-behaved-ness in my own children, easy to prepare a child to go out into the world in a presentable way. There is no excuse for the boy to not brush his hair this morning. I really try hard not to talk too much about such things, but really this is getting ridiculous. Rain and snow and ice and it’s all just a muddy mess. Need to go upstairs and see if the children have some form of schooling today or if the overly-cautious district has cancelled yet again. There’s not been a full week of school since Winter Break ended. It’s as if it never ended at all.